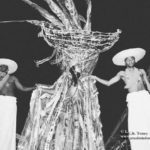 This is part 1 in a series of interviews I did with a few members of Touch D Sky Moko Jumbies. 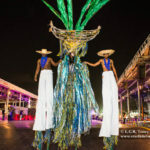 Touch D Sky has the honor of being the first band to win a Queen of Carnival title with a masquerader on stilts – Stephanie Kanhai as Sweet Waters of Africa in Carnival 2015. Part 2 will follow tomorrow. Jonadiah Gonzales and Adrian Young started TouchDSky in 2012 and asked Alan Vaughan to work with them as designer. 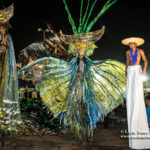 They had met earlier that year when Young played Vaughn’s costume “Crow” for Carnival King, as part of a band for Junior Bisnath’s Kaisokah Moko Jumbies, and made a huge impact with his performance, placing 4th . “We wanted to take Moko Jumbie to a different level to what was generally happening. They and a few others were experienced and very talented but felt they needed more control over what they did, and the same with myself, as we were not having the opportunities to create truly significant Mas by putting all the elements together – the cultural history of Moko Jumbie, their performance skills, and the conceptual and design elements which would elevate Moko Jumbie above just being used as a part of larger bands or for children’s Mas. When we started we had no resources at all, and our first band for Carnival 2013 was extremely difficult. We initially had a squat in Tarodale, San Fernando where we were making Mas, but the police evicted us, and we moved into the bedroom of one of the other jumbies, which he shared with his three brothers. We used an upturned door as a table, and as I was also staying there – we slept wherever we could find a space. I would be sewing and making things at night while the little boys slept around me. To make it more difficult, Young and Jay Jay (Jonadiah Gonzales) had got jobs with Universoul Circus and the tour started early, so they had to leave for the USA just before Carnival. Most of the costumes were made with clothes I had bought from charity shops and cut up and re-made. Amazingly we had some success, placing 8th in Carnival King, and 1st and 2nd in Traditional Mas, but Stephanie’s Queen “La Diablesse de la Revolution” slid on stage on a piece of foil from another costume, and she fell in front of the judges during the preliminary round and was disqualified. We also never managed to play for more than about an hour on Carnival Tuesday, as everyone was too stressed, and ill with food poisoning, and to make it worse, some of our costume pieces were stolen on the road as we were tying up. Following this experience, and the fact that Jonadiah and Young were once again in the circus in 2014, we decided not to try to bring out a band but to work towards doing it well in 2015. *These posts were scheduled to be published 3 days earlier but for some strange reason don’t appear on the blog. I’m taking steps to fix the problem. OMG. It is simply beautiful. Would love to see more.This is truly carnival.